It’s been a while since we’ve had a chance to profile one of the amazing RDs here at iLiveWell! 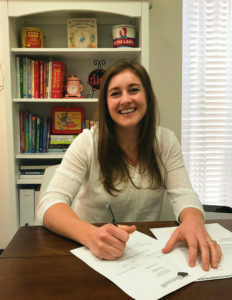 Let’s take a minute to learn more about one of our newest dietitians, Rachael, and how she got in to the world of nutrition. You also just might get some inspo for your next go to snack! What brought you into nutrition? I love learning about how food plays a role in mood, energy, and quality of life. I’ve always wanted to help others, and my passion for food and nutrition seemed like a wonderful place to do that! What is your favorite part about the day as a dietitian? My favorite part of the day is getting to know my clients. I feel so honored that people allow me to join them on their journey to building a healthy relationship with food. What is your go-to snack on a busy day? How many can I list? I just tried the Coconut Cream whole milk Greek yogurt from Trader Joe’s, so that’s at the top of my list. I also love cheese and crackers, cereal, or going old school with a PB&J. What is your favorite dinner to cook at home? I’m all about easy dinners that also taste good. Crock-pot chili and bison breakfast hash have been in the rotation lately. For a special occasion, I’ll make steaks with baked potatoes and asparagus.